No prison can hold him. No trap can contain him. He is Scott Free, the worldwide celebrity sensation known as Mister Miracle, and he is the greatest escape artist who ever lived. But can he pull off the ultimate trick--and escape death itself? Something has gone horribly wrong with the perfect life that Scott and his wife Big Barda have made for themselves on Earth. With war raging between their homeworlds of Apokolips and New Genesis, Scott's cruel adoptive father, Darkseid, seems to have finally found the Anti-Life Equation--the weapon that will give him total victory. As the mountains of bodies on both sides grow ever higher, only Mister Miracle can stop the slaughter and restore peace. But the terrible power of the Anti-Life Equation may already be at work in his own mind, warping his reality and shattering the fragile happiness he's found with the woman he loves. Is death the trap that's been waiting for him all along? Or is it life itself? And what price will Scott Free have to pay to learn the answer? Eisner Award winners Tom King and Mitch Gerads present a bold new vision of one of Jack Kirby's greatest creations with Mister Miracle--powerful, intimate and utterly unique, this modern comics classic will challenge everything you know about super-heroism! Collects the entire 12-issue series. Tom King is a comic book writer and novelist, best known for his work at DC Comics including Batman, Mr. Mireacle and The Omega Men. 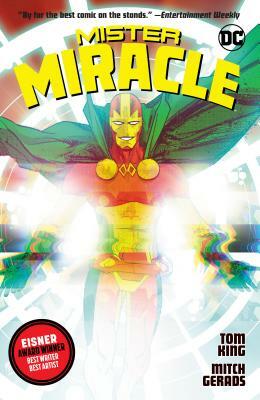 He won Eisner awards for best writer for his work on Mister Miracle and Marvel's Vision. He often relies on his experience as an ex-CIA agent and experiences during the recent conflicts in the Middle East in his writing. King joined the CIA counterterrorism unit after September 11 where he stayed for seven years before to writing his first novel A Once Crowded Sky.